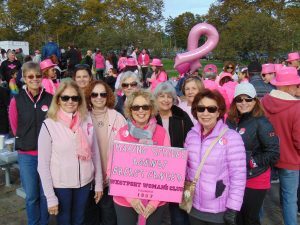 On Sunday, October 14th, Westport Woman’s Club members and friends raised funds and participated in the American Cancer Society’s MAKING STRIDES Against Breast Cancer Walk at Sherwood Island State Park. This annual Fairfield County fundraising event draws thousands of participants. Thanks to WWC member Audrey Rabinowitz for organizing our club’s participation again this year.